Present or past, time in Jefferson Township is easy to enjoy. 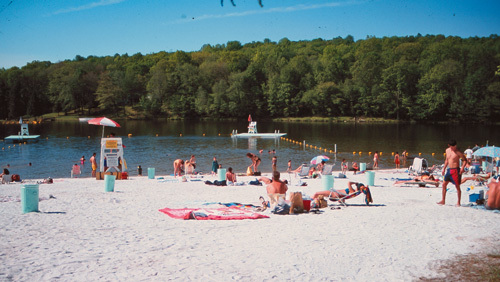 The northwest corner of Morris County includes Lake Hopatcong, as well as numerous smaller lakes and ponds throughout, many a product of the Rockaway River which rolls south out of Sussex County through the Berkshire Valley on the township's east side. Near the county's highest elevation, at the top of Bowling Green Mountain, Headley Overlook watches over the Rockaway River Wildlife Management. 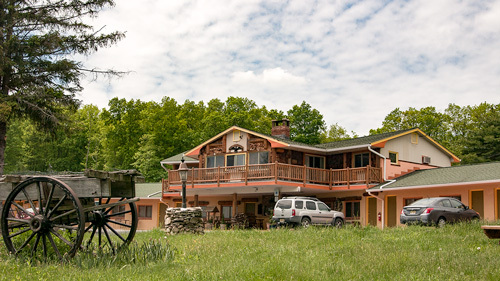 The overlook is a popular spot for the thousands of hikers and campers that know the pleasures of Mahlon Dickerson Reservation, which, encompassing 3,200 acres of near wilderness and recreational areas, is the county park system's most impressive outpost. 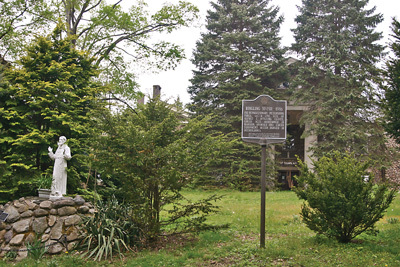 Named for New Jersey's seventh governor (1815-1817), the hills of Mahlon Dickerson are yet another signature for Northwest New Jersey's role in nineteenth century America's industrial development. Dickerson, and his family before him, was, in fact, a powerful force in the Mt. Hope mining community a few miles to the southeast. But there is evidence of mining settlement throughout the park, many of which were no doubt inspired by the successes at Dickerson Mine. You can get a feel for Jefferson and have a nice afternoon adventure on a loop more or less around Bowling Green Mt., starting in and up the Berkshire Valley to Petersburg, over the mountain through Milton and Jefferson (town), and back through the Weldon Brook Valley along Weldon Road towards Lake Hopatcong. Berkshire Valley Road heads off State Highway 15 up the valley with the Rockaway on the right, the mountain to the left. 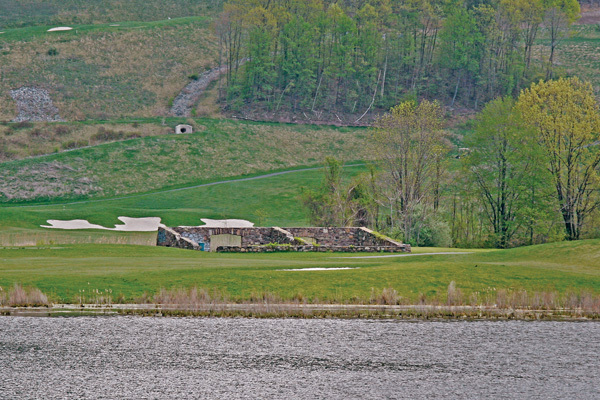 Past Longwood Lake, then the hamlet of Woodstock, you'll see evidence of county park domain at the Berkshire Valley Golf Course on the right and a lake called Swannanoa on the left. Before the Revolutionary War, this area was called Petersburg Forge, referred to years later as Petersburg. In the early 1900s, Alfred T. Ringling, fourth oldest of the seven brothers who founded the Ringling Brothers Circus, built his estate here as well as several other buildings that still stand on both sides of the road. The former Ringling Manor serves as a monastery. Below: Part of the Ringling Estate, this former carriage house sits beside Berkshire Valley Road. On the hill behind the carriage house, a stone water tower is said to have also housed Ringling Circus monkeys. By the time he completed his mansion in 1916, Ringling probably spent more than a million dollars establishing his 1000-acre property, including a 28-room manor, arched horseshoe gates, gate houses and outbuildings, all built with native stone. The mansion is said to be made with poured concrete. Other buildings functioned as part of the circus business and included a theater, carriage house, houses for the big cats and elephants, and a unique arrangement where monkeys were housed in a portion of the stone silo-like water tower. To provide a reliable water supply for his animals, Ringling constructed two dams along a natural pond or two fed by a branch of the Rockaway River. The original natural ponds became today's Lake Swannanoa. In about 1917, Alfred's son, Richard T. Ringling, formed his own circus on his father's estate, also using it as a winter quarters. To avoid confusion with his father's extravaganza, Richard reversed his name before attaching it to his own young circus, the R. T. Richards Circus. It lasted only a few years. For a while, circus animals and equipment were kept on the grounds, housed within the estate's buildings. Prospective circus performers auditioned in the manor house which had its own music room and large pipe organ. However, not everyone who performed in the manor house was a neophyte. Geraldine Farrar, a well known songstress and film star of the time, sang in the manor for the Ringlings and their guests. Unfortunately, Alfred T. Ringling died in 1919, and was not able to enjoy his country paradise for long. His widow sold the estate, which ended up divided into building lots for cottages or small summer homes. For a while, the manor house was used as a night club, some local whispers claiming that alcohol was served there during Prohibition. Legend says that even the lion house was used to make or store illegal booze, with the big cats serving as a natural barrier from nosy revenuers. True or not, the manor's illicit reputation was redeemed when it was purchased and put to use as a monastery in the 1950s by the Spes Foundation, an order of the Catholic Church. The remains of Ringling elephant house as been incorporated into Berkshire Valley Golf Course. 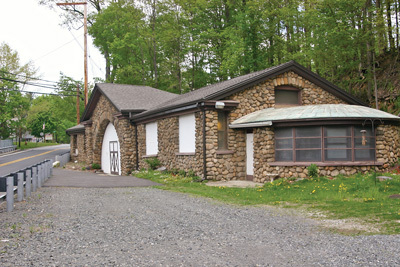 In 1976 Ringling Manor was added to the National Register of Historic Places, including the area from Lake Swannanoa's north dam, around Manor Drive, then some distance across Berkshire Valley Road. Around 1994 non-original portions of the estate's elephant house that had deteriorated beyond repair were demolished. The remaining structure, basically a large foundation, includes the arches and walls of the original 1917 structure. By the time Morris County's Berkshire Valley Golf Course opened surrounding the site, the remains of the old elephant house foundation had been nicely incorporated into the 12th hole. Continue a short way to Legion Road on the left which then joins Milton Road then Dover-Milton Road. Bear left on Weldon Road where Russia Road enters from the right, then where Sparta Mountain Road enters again from the right. You'll see the Jefferson school complex on your left, then an entrance to Mahlon Dickerson on your right. Many of the reservation's 20 miles of trails are accessible from this parking area, including one back across the road to Headley Overlook. 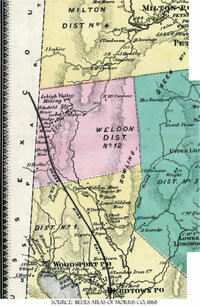 The Beers Atlas shows Weldon District No. 12 along with the structures within and the Ogden Mine Rail line heading towards Hurdtown and Lake Hopatcong a short distance beyond. When you plan a trip into the woods and fields of Northwest New Jersey, it's always a good idea to consult a map, sometimes as directions to the past. As is the case nearly everywhere in the Skylands, the evidence of past human endeavors lies hidden just below the surface. To catch a glimpse of an area's history, old maps are invaluable. For Morris County, two especially helpful sources are available: Beers' 1868 and Robinson's 1887 Atlases of Morris County. Of reasonable accuracy, these maps labeled dwellings, factories, mines, and hamlets, providing helpful insights about daily life 150 years ago. The atlases also labeled the political boundaries of various "districts, usually drawn around the many small school zones of the time. Nearly every district contained one centrally located building that functioned as a school. One of these districts on the 1868 Jefferson Township map is labeled "Weldon District No. 12â€. Roughly 1 ½ miles square, it lay between the districts of Milton, Longwood, and Hurdtown, with Sussex County on its western border. Today, District #12 is part of the Mahlon Dickerson Reservation. Although most of District 12 was uninhabited in 1868, it's western portion had more than a dozen structures stretched out along a quarter-mile portion of Weldon Road, interspersed amidst three mine sites labeled Dodge, Ford, and Schofield. Some of the structures such as those labeled "operations, "engine house" and "shaft", obviously relate to mining functions. But the presence of one of the northerly buildings, labeled "School No. 12, indicates that families raised their children and lived everyday lives in this tiny hamlet. By 1887 the original district was expanded and reorganized to include additional areas a short distance south and a second active mining area, the Weldon Mines. Re-labeled "Weldon District No. 25", the former school house was apparently replaced by "School No. 25" then located in the southern portion of the Dodge Mine area, along the eastern edge of Weldon Road. A walk through the area today yields scarce suggestion of its former settlements. You'll see a few foundations, stone walls with threaded rods protruding upward, and a fenced-in old well. And you will notice a few water-filled pits and trenches aligned sporadically along the quarter-mile labeled on the old maps as the Schofield, Ford, and Dodge Mines. Without the maps, they're just muddy holes. 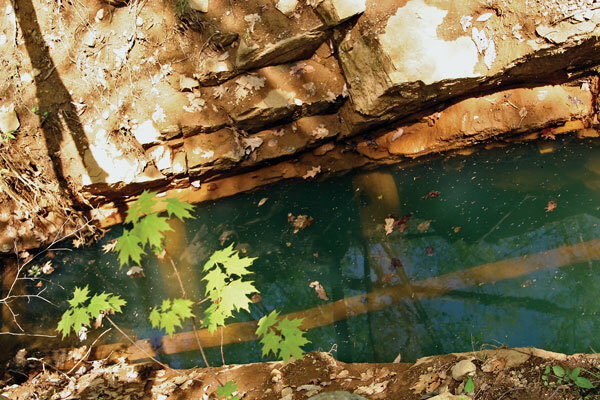 The atlases make you wonder what exactly lies beneath these old mine workings. Except for one or two excellent web sites and a few old State bulletins, very little information is available about the mines that were once worked here. There are no plaques, no signs. That seems to be a shame considering the terrific amount of effort necessary to hack out tons of solid rock by tunneling deep beneath the surface of the earth, under today's park. The iron ore of the Schofield Mine was worked sporadically through most of the latter half of the 1800s. As with all the other mines of the area, the on-again-off-again activity of the mine was affected by the fluctuating prices of iron ore vs. the costs of its processing and transportation. Today, the remains of the Schofield Mine, a couple of large water-filled trenches, are surrounded by a chain-link fence, and household debris lying around the site indicates more recent use as a dump. Prosaic as they may seem today, an old mine book claims these trenches went down a few hundred feet. Imagine that!! You cannot help but wonder what it must have felt like for a miner to be lowered down deep into the darkness of that trench. Signs of the workings at Ford Mine remain around this pond, which, at the surface of a former shaft, reaches depths of several hundred feet. A few hundred feet south, a beautiful little pond lies in an idyllic setting just off Weldon Road. Frogs croak along its edges, bordered by wildflowers. But a glance here and there around the pond reveals disturbances in the earth and rock nearby. What's that about? This is actually one of the main shafts for the Ford Mine, (not to be confused with another Ford Mine located near Hibernia). Old references claim its depth to be as great as 400 feet; so, be very careful wading in THAT pond! Both the Ford and Schofield Mines were worked during the same periods of time, their shafts little more than 100 feet apart. In the early 1880s, 20,000 tons of iron ore were chiseled, picked, dug, hoisted, and carted away each year. 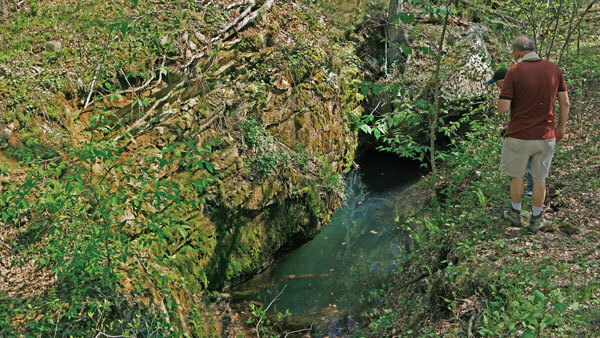 While each mine worked its own upper ore veins, the workings of the two mines eventually may have been connected by mining through a vein located a couple of hundred feet below the surface. These stone foundations and threaded rods once held pumps to control water seeping into the mine workings and hoists to get men into the mine and the hard-worked ore out. Located east of Toomey's Pond, evidence of the Dodge Mine is not seen as clearly in aerial photos as is that of its two neighbors to the north. Surface evidence today consists of some small piles of broken rock, a fairly large stone foundation near what appears to be a stone-lined well, and half a dozen small water-filled pits resembling large mud puddles. Stone foundations, some with embedded threaded rods protruding outward, sit near some of the pits. The iron ore from this mine was worked mainly during the last half of the 1800s, and those muddy water pits, although only a dozen or so yards across, most certainly go down a lot farther than the murky water will allow us to see. The stone foundations with the threaded rods once held mining equipment such as pumps, hoists, and engines; the pumps brought out the ever-present seeping mine water and the hoists lifted out the hard-worked ore. Miners were also transported down and back by the hoists. References indicate this mine had at least two shafts, one was about 90 feet deep, the other was at least 165 feet deep! Off to the west of the mines, the old maps show a railroad line passing by. This was the Ogden Mine Railroad, constructed around 1865 for the sole purpose of transporting ore from the local mines to Lake Hopatcong where it would be shipped on canal boats via the Morris Canal to various processing facilities. The maps also show a spur line branching off of the main rail line, then passing between the Dodge Mine structures, and terminating at the Ford Mine. Although both the mine spur and the Ogden Mine Railroad are gone, a portion of the bed of the latter lies within the Mahlon Dickerson Reservation and has been incorporated into the Highlands Trail network. Above: A shaft at the Weldon site. Bottom: Timbers that supported a mineshaft at Weldon are visible beneath the water's surface. Both the 1868 Beers and the 1887 Robinson atlases show the Weldon Mines a mile or so south of the Dodge Mine community but only on the 1887 map has the local district been expanded enough to include them. The Weldon Mines were located on the east side of Weldon Brook, across Weldon Road about a mile south of Saffin's Pond. 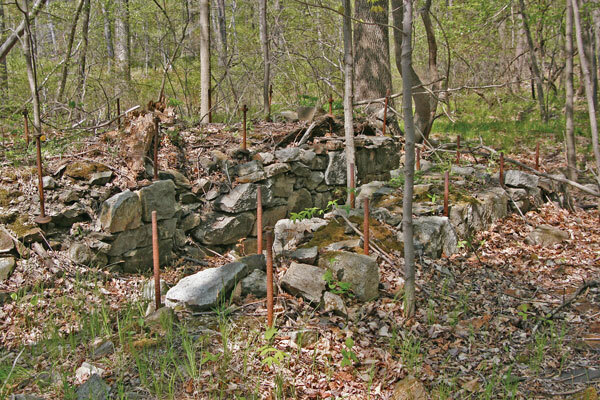 Today only a few foundations, some large rock piles, and a series of steeply angled water-filled openings remain, some of which lie within the southernmost part of Mahlon Dickerson. 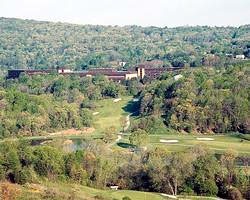 Over the years this half-mile long series of openings has been referred to as the Upper and Lower Weldon Mines. The oldest workings of these mines were started near the beginning of the 1800s and had already been worked extensively by the middle of the century. After that, they were worked sporadically, with at least one shaft reaching a few hundred feet in depth. Despite all the buildings up by the Dodge, Ford and Schofield Mines, there seemed to be no official name for them. Yet a bit south, close to the Weldon mines where there seems to be no hamlet at all, maps old and new label the area "Weldon" as if indeed a hamlet or village existed there. On some old maps there appears to be a small cluster of buildings somewhat northwest of the Weldon mines but there is no indication of what purpose they may have served. Since this mine preceded the others, there may have been an earlier settlement that does not appear on the later maps. Thanks to Bob Peal for an engaging afternoon and an appreciation of what lies before our eyes.